This is the stuff that miracles are made out of. Impossibilities. “Nevers.” Dreams that you didn’t even dare to dream coming true. This is Talia’s story. Talia was born on a cold February day in Northern China. Four months later she was abandoned – left alone in a hotel room. 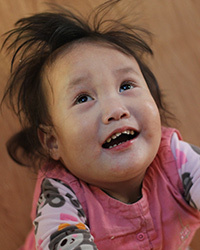 Her birth parents must have been watching their little girl with a cleft palate slowly grow thin and frail, her skin gradually become jaundiced, her belly distended and her once-white eyes glow yellowish-green. Something was terribly wrong with their little one. Maybe she was dying? She was. We will never know just how much Talia’s birthparents knew about her situation when they abandoned her on that June day, but we can guess that their decision to leave their baby girl alone was a desperate measure to give her a chance at survival, and Talia would need a miracle to survive. 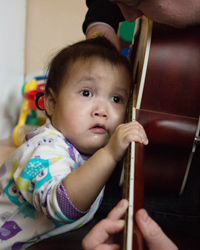 When she arrived at the orphanage Talia was diagnosed with a cleft palate, a heart defect and a liver disease called “Biliary Atresia.” Biliary atresia is a congenital defect where the bile ducts between the liver and the intestine are either malformed or not formed at all. If caught and treated early, the child can avoid a liver transplant for a few years. If not, they have about 18 months to get a new liver or they will die. Talia had just one year remaining to get a new liver or she would die. Talia’s orphanage knew that she would have no hope at all if she remained where she was. The hospitals in her province could never do a liver transplant, even if an organ were to become available. We knew that it would take a miracle for Talia to survive, because organ donations are so rare in China. Only 1 person of every 150 gets the transplant that they need, and Talia’s position in society as an orphan would technically make her chances non-existent. 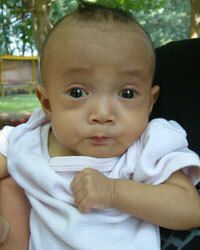 Still, we knew that we had to try to give her life, and so Talia arrived at New Day Foster Home July 26, 2012. Deep sadness greeted us when we met her. Abandoned only a month earlier and then living in a hospital had damaged the already broken heart of this little girl. We knew that on top of good nutrition, medical care and access to top hospitals, Talia needed a triple dose of love and so we gave it to her. It didn’t take long for Talia’s grim expressions to be replaced by giggles of joy. Her personality made us laugh and getting to know her was an awesome privilege. But the smiles and the giggles were not independent of the discomfort and pain that Talia experienced on a daily basis. We watched as her color grew more jaundiced and her belly more distended. We worried that Talia’s miracle wouldn’t come in time. It was 5am on a Friday morning at the end of May when we got the call. There was a liver on its way to the hospital and if Talia could get there on time and was healthy enough for surgery, it would be hers. By 8am she was at the hospital running every test imaginable. She had spiked a fever early that morning, but her lungs looked clear and this was her chance at life. By late morning she was in surgery and 9.5 hours later the doctors told us that it was a success! However, the next few days would show us whether Talia’s body would accept the new liver or not. After the first day she was still running a fever, was restless despite being sedated and her liver enzyme levels were through the roof. The next few days showed gradual improvement, and on day three Talia was taken off of the ventilator. After a month of tweaking medications, and keeping an eye on Talia’s incision, she was released from the hospital July 2nd, 2013. Talia is home. She still has some surgeries ahead of her, but her life has been saved in the most incredible way: a miracle.